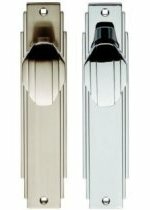 Art Deco Waldorf door handles, supplied in pairs with follower bar and fixings size 203 x 66mm. 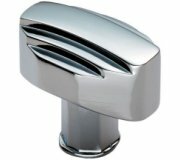 Available in Polished Brass, Polished Chrome, Satin Chrome, Antique Brass, Satin Nickel & Polished Nickel finish. 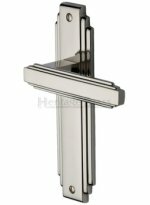 Polished nickel Art Deco Waldorf door handles, supplied in pairs with follower bar and fixings size 203 x 66mm. 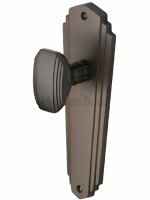 Matt bronze Art Deco Waldorf door handles, supplied in pairs with follower bar and fixings size 203 x 66mm. Art Deco Charlston door knobs on backplate, supplied half sprung in pairs with follower bar and fixings size 203 x 66mm. 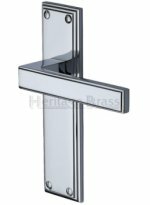 Available in Polished Brass, Polished Chrome, Satin Chrome, Antique Brass & Satin Nickel. Picture shows the Latch Plate Knobs. 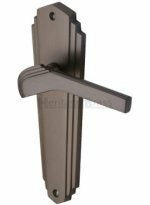 Art Deco Tiffany door handles in a matt bronze finish on solid brass, supplied in pairs with follower bar and fixings size 204 x 49mm. 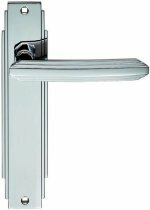 Art Deco Atlantis door handles cast in solid brass, supplied in pairs with follower bar and fixings size 185 x 48mm. 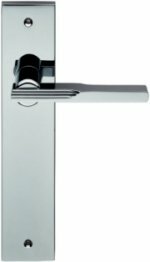 Art Deco Atlantis door handles in a satin brass finish on solid brass, supplied in pairs with follower bar and fixings size 185 x 48mm. 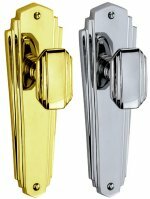 Art Deco Astoria door handles cast in solid brass, supplied in pairs with follower bar and fixings size 204 x 49mm. 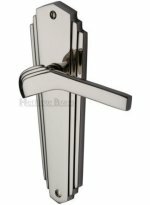 Art Deco Astoria door handles in polished nickel finish on solid brass, supplied in pairs with follower bar and fixings size 204 x 49mm. Art Deco Tiffany door handles on a 53mm round rose cast in solid brass, supplied in pairs with follower bar and fixings. Available in Polished Brass, Antique Brass, Satin Brass, Polished Chrome, Satin Nickel, Polished Nickel & Matt Bronze. Art Deco Broadway door knobs on backplate, supplied in pairs with follower bar and fixings size 156 x 62mm. 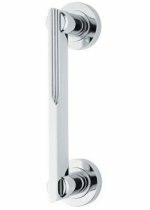 Available in Polished Chrome, Antique Brass & Satin Chrome. Matt Bronze Art Deco Charlston door knobs on backplate, supplied half sprung in pairs with follower bar and fixings size 203 x 66mm. Carlisle Brass Art Deco door handles on a 205mm x 45mm backplate, lever length 132mm, projection 52mm. Supplied in pairs with spindle and bolt through fixings. Carlisle Brass Art Deco door knobs on a 205mm x 45mm backplate, knob length 60mm, projection 61mm. These door knobs are unsprung and need be used with a good quality latch. Supplied in pairs with spindle and bolt through fixings. 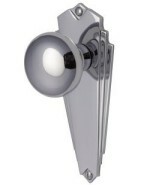 Designer art deco door lever handle set in polished brass supplied complete with fixings on 51mm diameter back rose. Lever length 120mm, projection 61mm. 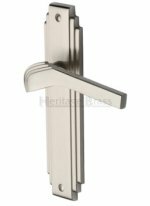 Veronica Italian designer art deco style door handles on backplate produced to the highest quality standards in hot stamped brass. Backplate 240mm x 50mm, lever length 120mm, projection 60mm. Supplied in pairs complete with all fixings. 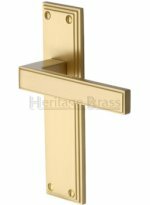 Premium quality Deco door handles, cast in solid brass, supplied in pairs with follower bar and fixings. 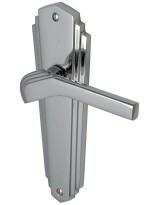 Door handle size 185 x 44mm. 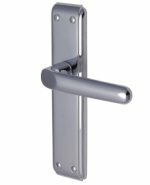 Available in Polished Chrome, Satin Chrome & Satin Nickel finish. Art Deco solid brass door knobs on a 52mm square back rose. Knob diameter 50mm, projection 56mm. Available in Polished Chrome, Polished Brass & Satin Chrome. 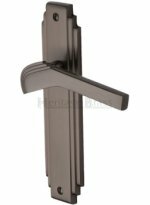 Art deco cupboard handles, 160mm fixing centres, 190mm overall length, 35mm projection. Art deco cupboard knobs, 30mm x 20mm square, on 11mm rose, projection 27mm.